Show your support of Peace by placing this high quality 5.5" round magnet on your car, mailbox, garage door, or refrigerator. 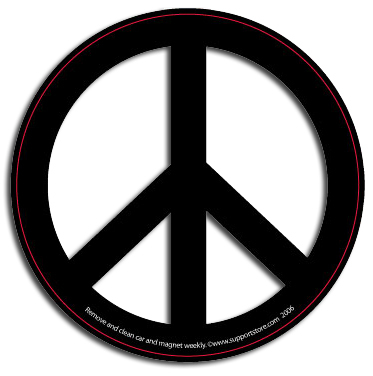 The peace symboi is printed in glossy black ink on a white background, this is a round white vinyl car magnet with the peace symbol printed on top. We print on premium quality, super-thick (.030) magnetic material with top quality, UV protected inks. Be sure to remove, clean and reposition your magnet weekly.